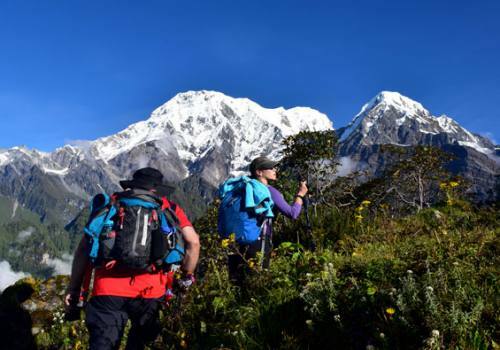 This trekking program is developed for those people who look for the chance to observe super Tibetan Buddhism festival in Nepal and magnificent mountain view of Nilgiri and Dhaulagiri. The Yartung fair festival is celebrated all over Mustang and is especially celebrated in Muktinath during August full moon day every year. It is a three day celebration and is celebrated with horse races, drinking and dancing by local Thakali people. 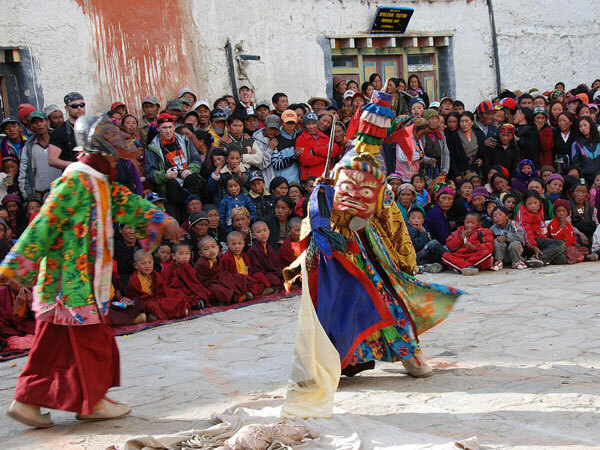 During the three days celebration, we have the King´s (local king) activities taking place on the first, the lamas and monks on the second and the local people´s on the third. The most attractive occasion of this festival is the horse race contest by man and woman. In their language, Yartung means the end of summer; Mela means festival or fair; Yartung Mela means a festival to send off summer. So, they celebrate this festival with enthusiasm, appreciating the good lives the summer has brought to them. By that time, they have finished harvesting the crops and they have stored the cereal at home. 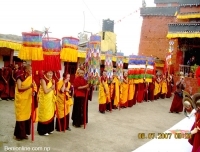 In fact, this festival is for making offerings to Bodhisattvas and to receive the blessings from the village chief as well as from respectable senior citizens for an auspicious journey. Their senior respectable priest, called Lama, sets the day for celebrating Yartung Mela, finding the most auspicious day in their calendar and keeping in mind the view of completion of harvesting crops. Usually, their priest chooses the full moon day called Janai Purnima for celebrating this festival. We can see the deep combination between Buddhism and Hinduism here. 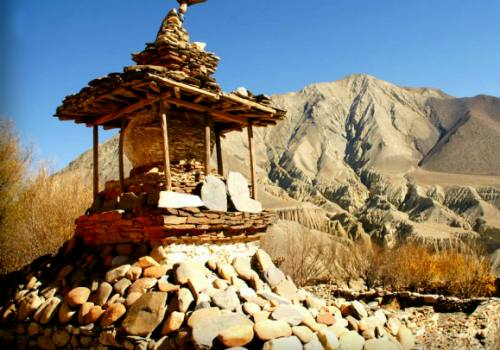 The main feature of this trek are; Yartung fair performed by Local People, Lamas, Monks and Horse Race competition by man and woman, Muktinath temple, Jwala Mai monastery, culture dancing, Bonpo Gompa in Lupra, majestic view of Mt. 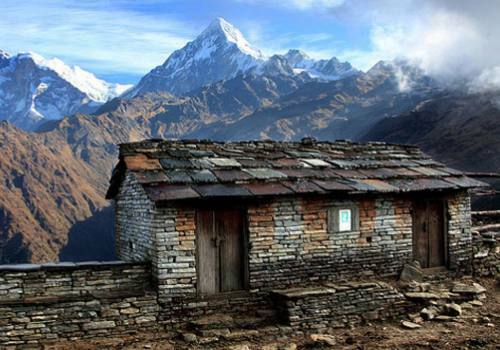 Dhaulagiri and Nilgiri, traditional and old fashioned villages. Day 01: Kathmandu to Pokhara, 6-7 hours drive or 25mins flight. 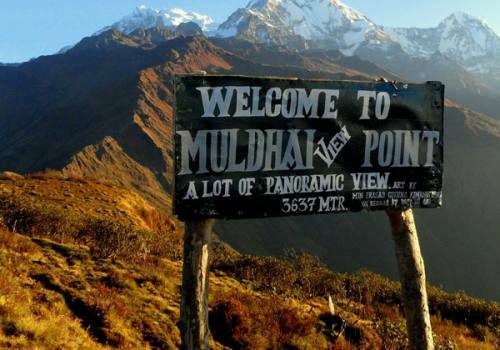 Drive Kathmandu to Pokhara, 210 Km by tourist bus or take domestic flight of 25 minutes, through the Trisuli River side and it takes about 7 hrs to reach Pokhara. Upon arrival in Pokhara we have short sightseeing/walk in places like Lake Side, Taal Barahi temple on Phewa Lake and enjoy boating. Stay overnight in hotel. 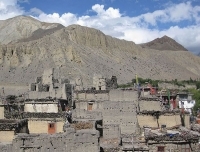 Day 03:Fly to Jomsom (2710m) and trek to Kagbeni 2810m about 4-5 hours walk. 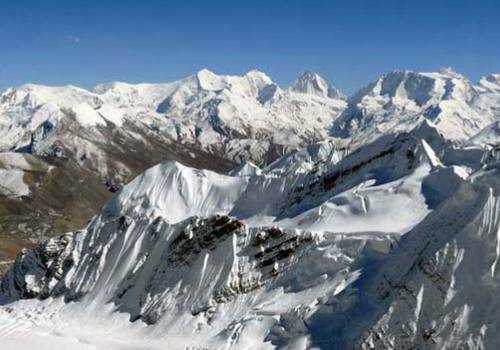 Fly to Jomsom from Pokhara and trek to Kagbeni via Lupra 2790m. 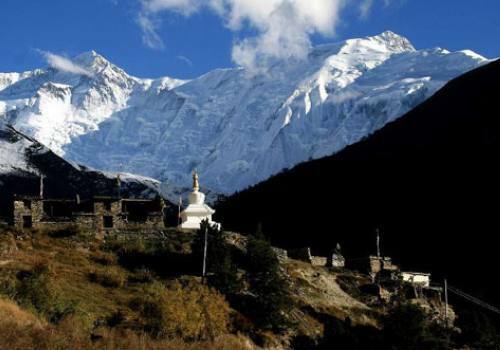 Continue trek passing River bank of Kaligandaki to reach Lupra, where you can visit the interesting Bon-Po monastery. Bon-Po is a sect which mixes pre- Buddhist beliefs with religious practices close to Buddhism. After lunch at Eklabatti trek continues until reaching Kagbeni which takes about 1 hour. You can visit the red-painted monastery about 1000 years old. Stay overnight in Lodge. Day 04:Kagbeni to Muktinath (3800m); 5-6 hours. 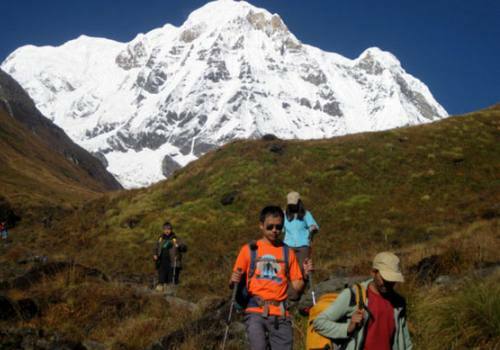 The trail steeply ascent brings you to Kinghar village about 2 hours. Then you continue until reaching Jharkot which takes about 1 hour and visit the old Sakya Monastery and Traditional Medical centre. 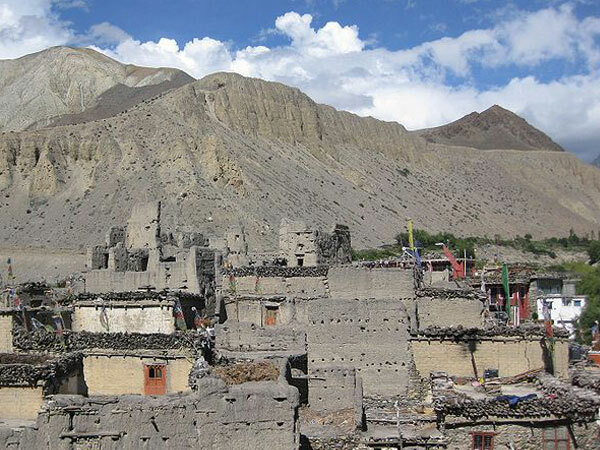 After lunch at Jharkot, you ascend a little more to reach Muktinath about 1 hour, visit a secret place for Hindus and Tibetan Buddhist in about 30 minutes in its compound. You can see the 108 water spouts. The Muktinath temple stands enshrining Vishnu, a Hindu god. For Hindus, it’s the next most holy place in Nepal after Pashupatinath. According to legend; when you visit the Muktinath temple, you are free/salvation, you´ll escape from the suffering of cycling rebirth. And below, there is another ancient Buddhist Gompa where the combination of earth-water-fire gives Muktinath great religious significance. 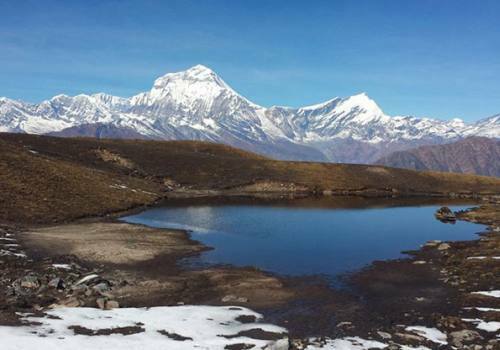 Picturesque view of Nilgiri and Dhaulagiri mountains. 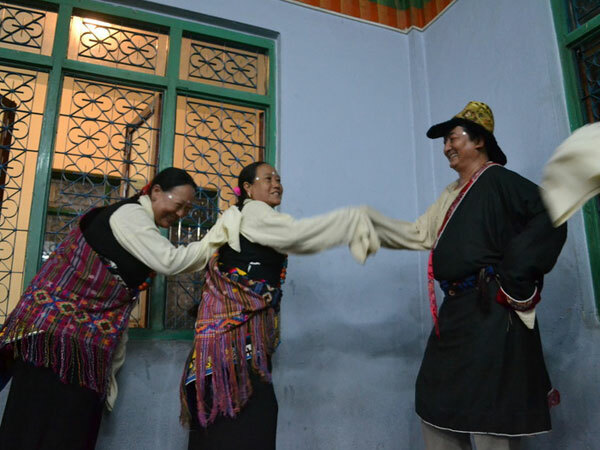 Experience the culture in Yartung Fair. 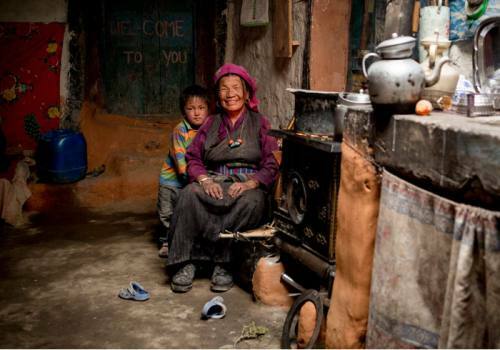 Early morning, they first visit the Goddess of Flame called Jwala Mai and make offerings to her, then Muktinath to offer prayers to Lord Muktinath ( God of freedom), and then to the monastery, Nursing monastery, to offer butter lamps to Bodhisattvas. 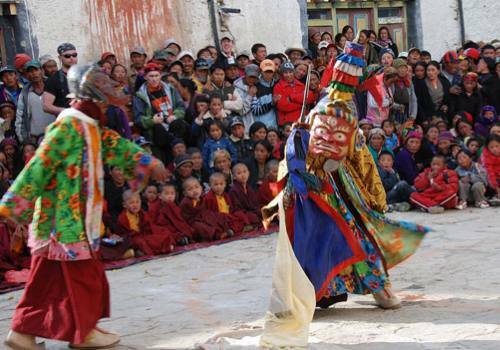 Thus, they spend the morning of Yartung Mela performing religious offerings to their deities. As Yartung Mela usually coincides with the Hindu festival called Janai Purnima, Hindus from far away visit Muktinath to change their sacred thread on this day. First, they wash their bodies in the water coming out of 108-water spouts surrounding the Muktinath temple starting at the first spout and ending at the last one. 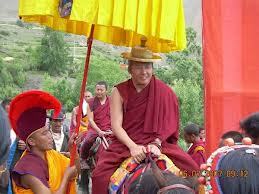 Then, they wear new sacred threads and go to make offerings to Lord Muktinath in the temple. 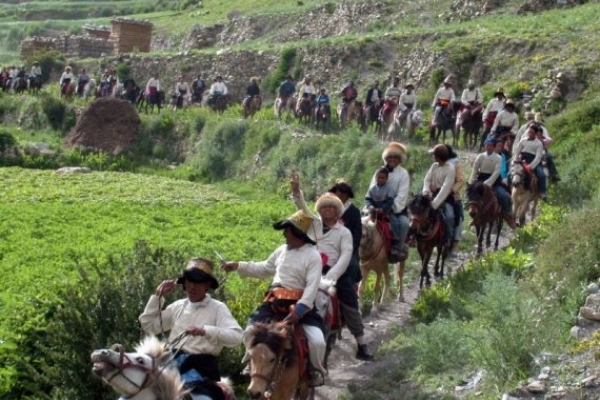 On the festival day, the local chief called Mukhiya previously the king of Jharkot dressed up in the traditional royal garments, riding a horse, leads a royal procession from Jharkot to Muktinath. The royal group performs dances at the stadium. The leader of the royal group stays at the center while other members around him rejoice and perform dances. They circle him a number of times while performing various sorts of dances. This enjoyment goes on for several hours. Then he blesses all people one by one. Again you can watch other sports activities. Finally, the main game of the show is the horse race by male and female. People come from Lamjung, Manang, Upper Mustang and Lower Mustang to take part in the contests. After completion of the games, the Mukhiya distributes prizes to the winners of the various games. That´s how Yartung fair ends. You´ll have a great auspicious event to remember with your friends or family. Stay overnight in Lodge. The trail is descending until reaching Eklabatti which takes about 3 hours. You will have lunch here. Then after, you keep following the level trail assing in the bank of Kali Gandaki River. Finally you arrive in Jomsom about 3 hours walk. Stay overnight in Lodge. Early in the morning fly back to Pokhara. 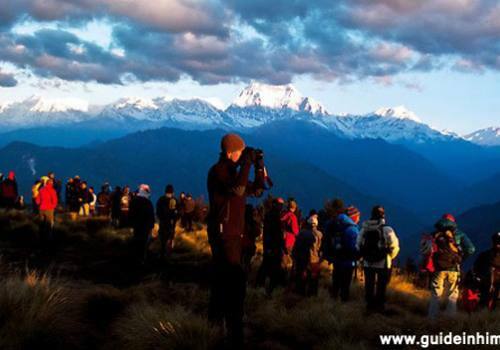 You have full day sightseeing in Pokhara like Devi’s fall, Gupteswor Cave, Mahendra cave, Seti River and World Peace Stupa etc. 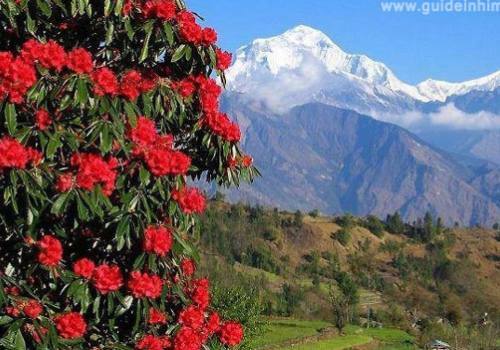 2 nights deluxe room in 2** hotel in Pokhara with breakfast on twin / double basis. All meals: lunch, breakfast, dinner tea, coffee and fruits during the trip. 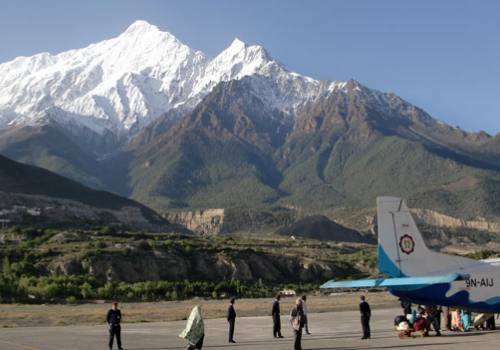 Pokhara – Jomsom – Pokhara domestic flight and airport taxes. Lodge accommodation during the trek on twin double sharing basis. Salary, food, accommodation and insurance of your guide. 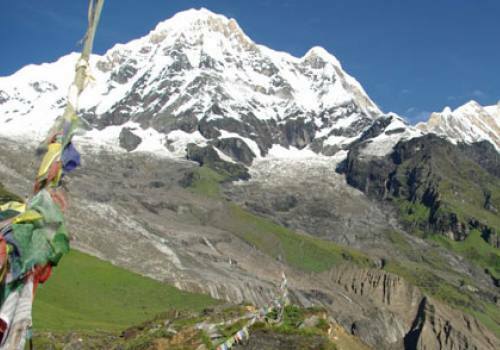 All necessary trekking permits for the trekking. Tourist bus transportation to and from Kathmandu. All government taxes and office service charge. All bar bills, beverages such as coke, fanta, mineral water. 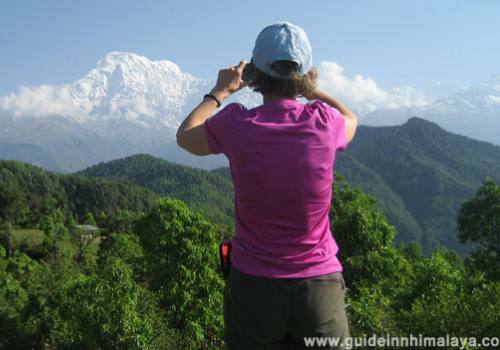 Personal travel insurance, internet, phone calls and wifi services during the trek. Personal travel insurance and rescue operation charge in case of emergency. Any costs which arise due to alter of the itinerary, because of landslides, political disturbance, and strikes etc, toiletries. Horse renting and porters hire if needed. Tips and gratitude for guide. A Short Note: This trip can be personalized as per your requirements that meet your time frame. The trip price will be according to Deluxe, Standard, Budget and group size so please kindly provide us your details for tailor made program.